This paper attempts to identify behavioral patterns and compare their average success considering several criteria of bounded rationality. 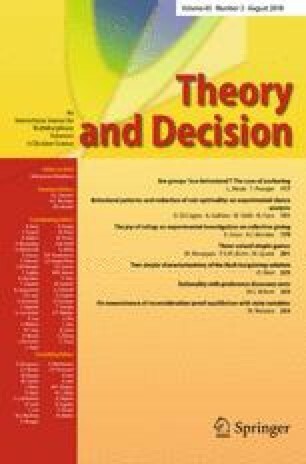 Experimentally observed choice behavior in various decision tasks is used to assess heterogeneity in how individual participants respond to 15 randomly ordered portfolio choices, each of which is experienced twice. Treatments differ in (not) granting probability information and in (not) eliciting aspirations. Since in our setting neither other regarding concerns nor risk attitude matter and probability of the binary chance move is (optimal) choice irrelevant, categorizing decision types relies on parameter dependence and choice adaptations. We find that most participants reduce systematically sub-optimality when following the identified criteria. The research presented in this paper was financed by the Max Planck Institute for Research on Collective Goods of Bonn. See Fig. 4 and Tables 13, 14.